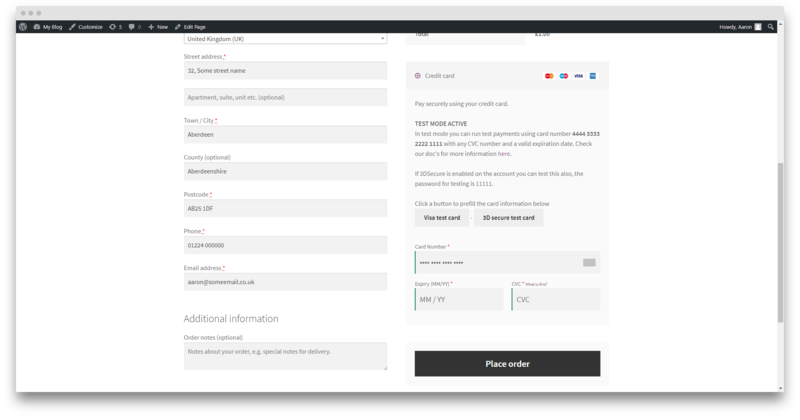 Integrate your WooCommerce store with Barclays ePDQ payment gateway. 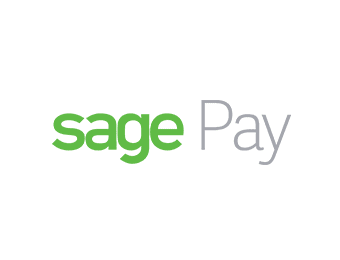 When choosing a payment gateway solution for your website, it's important to select a brand that not only you can trust to take care of your business payments, but inspires confidence and familiarity with your customers. In 2016, Barclaycard processed over £97bn of online payments and 2017 is expected to be even higher. 24% of card spending at UK merchants was online in 2016, up from 21% in 2014. Barclaycard is one of the most established & trusted merchant payment companies in the UK. The ePDQ Direct Link Payment Gateway provides a fast payment experience that takes place on your website.  If you require the off-site method (customers make payment on Barclays server) please check out our Barclaycard ePDQ Payment Gateway as you are required to be PCI compliant using the direct method. While the payment experience keeps the user on your own website, no card data is stored locally on your server. All sensitive card data is sent directly to Barclays which means an SSL certificate is absolutely essential. 3D secure authentication adds an additional layer of security, guaranteeing fewer chargebacks or fraudulent transactions. 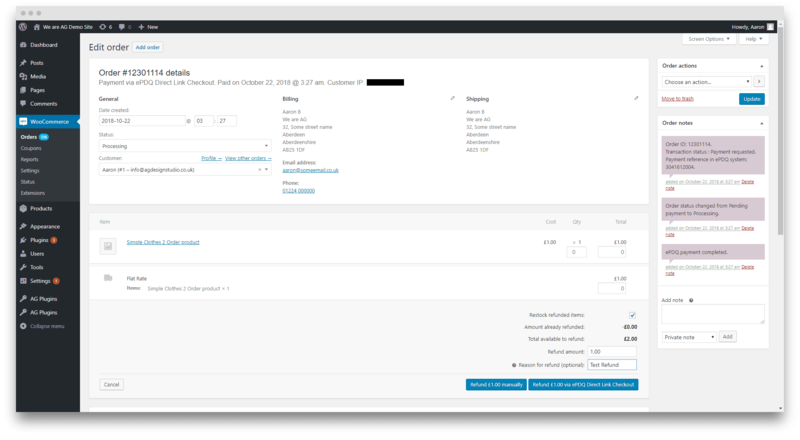 The Barclaycard ePDQ Direct Link plugin also streamlines order management, with the ability to process refunds directly from your WooCommerce admin panel. This is a direct method gateway plugin, payment is taken on your website, this means you are required to be PCI compliant and have an SSL in place. The plugin supports the use of an extra multi-currency PSPID account. One plugin for multiple currencies, keeping things simple. Rated 5 out of 5 stars based on 15 customer reviews. I had some minor setup issues with the Barclaycard side of things following go live and Aaron responded to my support request straight away to help sort things out. This is how customer service should be.. The plugin developer helped me through every step of integration. It was an absolute pleasure working with someone so patient. 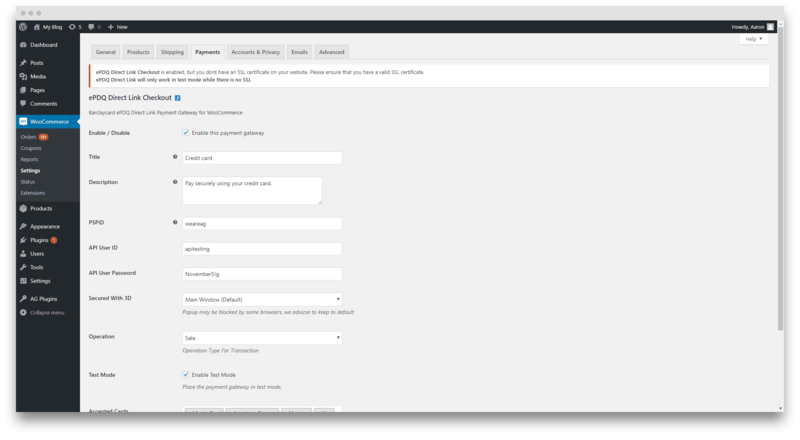 I was able to get our payment gateway setup so and the plugin developer both helped on a wordpress level and on the payment gateway level. Will order another 2 licenses for our other wooCommerce stores. Faultless rapid response in helping to diagnose issues and providing support. Plugin is easy to set up and works seamlessly..
Could not have been more impressed with your service especially Aaron - he was so helpful and came back to me straight away whatever the time. He solved all my queries and issues and was super friendly and explained things really well and clearly. Could not recommend you and Aaron enough! Thank you :-). Having tried many different Barclays plugins This one is by far the best. Easy to install and configure. I needed some assistance due to a small issue. The support was instant. Will use again, and can recommend to others.. Started using the plugin on a trial for a clients website. All parameters in both the plugin and Barclays ePDQ appeared correct but I just couldn't get it to take a payment. I emailed Support and got a quick reply, Aaron was all over it and got things working. He went above and beyond what was necessary. Turned out the problem was on the Barclays end (which was expected given how easy the plugin is to set up). I could not recommend the plugin, the company or support highly enough. The plugin was easy to follow but as I did not have the time to set it up, I asked support and Aaron was quick to answer. He set up the plugin within ~30 minutes and was happy to answer any questions I had. Aaron was very helpful and very quick with his responses. I would use this plugin again and would happily recommend it to anyone..
Aaron went above and beyond in assisting with the set-up of the plugin, due to some issues on barclaycard's side. Would definitely recommend the plugin and use it again.. Setting up the plugin was easy and very simple had some issue with connecting it to the ePDQ, But I contacted the support and within a couple of emails with them, the plugin was up and running perfectly. it integrates with WooCommerce perfectly. The plugin itself was easy to set up had some slight issues with the settings on EPQD and because of the fantastic fast support we were able to get it all working in no time. Very highly recommended thanks for all your help.. The plugin was easy to setup and get running on the same day. We had some small questions during the implementation and the support was beyond useful. Really quick response rate and super helpful. Would highly recommend this plugin and additional services - Thanks again!. The guys behind this plugin have really went over and above to help me get everything right. The plugin is spot on, simple and works perfectly, and the support is absolutely fantastic. I would recommend this - cheers guys!. Easy to install and setup and worked perfectly. I did need advice on settings for the Barclays Admin area and support were quick to help me..
Barclays ePDQ direct link payment on front end.  Shop employees can now process refunds for an order paid for with Barclays ePDQ direct link directly from within WooCommerce — no more logging into your Barclays ePDQ account to process refunds! Feature - Implemented both SHA in and out to the plugin. Feature - Form validation before submit improvements. Feature - New algorithm (Luhn) to check card numbers before submit. New - Two new functions, one for order notes and the other for order meta data. Dev - PHP compatibility issues fixed. Feature - Adding of two new buttons at checkout while in test mode. These will prefil in the card details for testing. 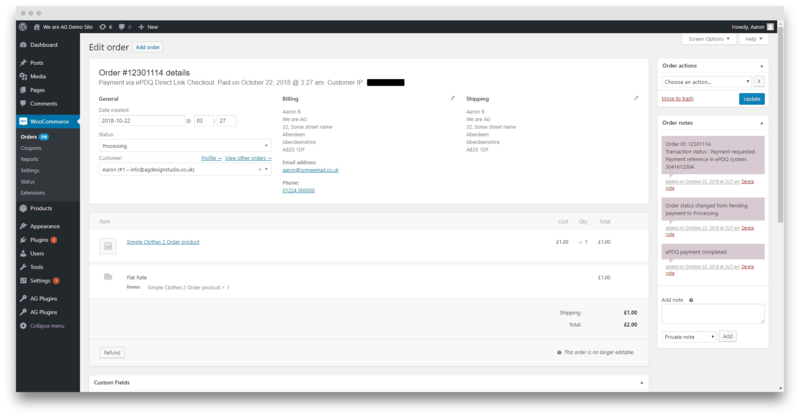 Feature - Mobile checkout is enhanced, offering automated card formatting and numerical (tel type) fields for easier input. Fix - Change how failed order work. Tweak - Adding of JCB logo to the select field. Tweak - New warnings for 3D secure issues. Feature - New, Whats this next to CVC to give end user tool tip on what CVC is. Tweak - Changed URL endpoint for EXCEPTIONURL. Fix - PHP standards issues. Fix - Fixed issue with logo not showing on checkout. Fix - Fixed issues with production refunds not processing. New Feature - Process payments with 3D secure and see results in order screen on shop. New Feature - Process refunds via the order screen in shop. Fix - Temp removal of SAH in/out settings.